I could be completely making it up, but I think I heard somewhere that memories are more easily formed if they are tied to strong emotion. But over the last couple of years, I’ve had random memories resurface – that certainly have some emotional affect now, but at the time, they were insignificant, probably because I didn’t have the maturity or life experience to understand their context. But lately, with how America seems so divided, these experiences have resurfaced and have been whirling around in my consciousness. At the time, I didn’t know what a “chink” was and I really didn’t understand why these complete strangers were yelling at me. I remember feeling a little scared – and being ready to yell “go away” and run if they were kidnappers as my parents taught me, but they drove away, laughing. The apparent danger now far away, I simply shrugged it off and honestly, didn’t even tell my parents or anyone for that matter until now. Fast forward to senior year in high school – it was almost time for graduation. In our small graduating class of 181, competition for class rank was high – at least for the top few positions. Ok, let me just be honest – I wanted to be valedictorian so badly and in dramatic high school fashion, thought my world would fall apart if I came in second (I did and it didn’t). I remember sitting in class behind who would end up being third in our class. We were talking about college and the scholarships we received. I shared that I was so relieved to receive a four-year scholarship to alleviate the burden on my immigrant parents (who still work 7 days a week, 365 days a year). My classmate’s response? But me being a person of color had nothing to do with it. The scholarship was based on three criteria: demonstrated academic performance, demonstrated leadership skills and financial need. I had to write several essays and I had an interview with 8 people at one time. Why didn’t you apply for it? Of course, I didn’t say all that. 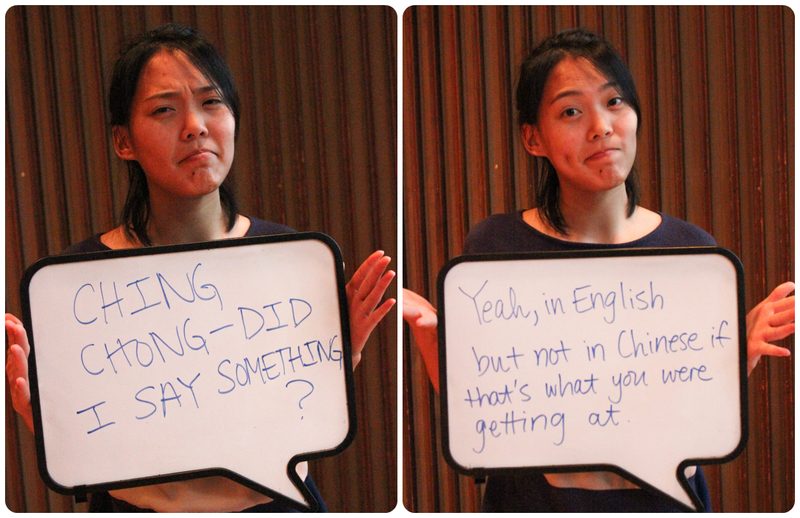 At age 18, I wasn’t naïve enough to shrug it off like the word “chink” at age 9, but I also didn’t know how to respond. So I didn’t say anything at all. Just tucked away the memory….. I still don’t think my classmate intended to be insulting or discriminatory. I mean, I knew him since the fifth grade. And honestly, at that age, I wasn’t even sure if it was discriminatory. At the time, I didn’t associate his comment with my race; rather, I was just miffed that he insinuated that I didn’t work hard for it or didn’t deserve it. Fast forward to senior year. I was president of a multicultural sorority, and for the first time, several of us were “crushed” by a fraternity in the Interfraternity Council (comprised of historically white fraternities). By way of explanation, at my college campus, we also had the National Pan-Hellenic Council which were comprised of historically African American fraternities and sororities, and my sorority was a part of the Multicultural Greek Council, which is comprised of other minorities) and invited to their Crush Party. It was my first time to attend a party hosted by an organization from the Interfraternity Council – and my sisters and I were really excited! It wasn’t because it was some type of historical achievement of acceptance. Not all all. It was just cause the guys that crushed us were really hot. It was a little shocking to witness some of the things (naked girls sliding down the pool slide), but generally, it was just like any other college party. “You must have heard me wrong.” She rolled her eyes; her group laughed and walked away. Why do I share these random experiences? Consistently for the same reason why I blog – to keep it real. To acknowledge and show solidarity with other minorities (whether it is gender, sexual orientation or other immutable characteristic) who may have had similar or likely, worse experiences. I see you. I don’t pretend to know what you’re going through, but I see you. But I also share to try to present some nuance to the binary representation in current society which would paint my high school classmate or the white sorority girl as a racist or bigot or inherently evil person by a single comment made at age 18 or 21. Don’t get me wrong – I don’t excuse their comments or sentiments, but at the same time, I think that those who are woke should also consider their own biases and whether painting the “other,” whether a man, whether white, or wealthy, etc. with the same broad brush that is applied to “us” really gets us anywhere.